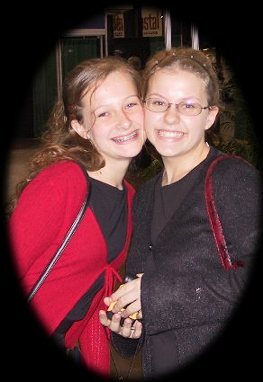 Me and Mindy at General Conference 2K1! Friends their cool what can i say? Music with out it i can't live. and well chatting on the net! Hi, my name is Lisa Smallwood I live in Paducah, KY. I am 15 years old. I sing in the school choir and I praise sing at my church. I'm easy to get along with. I wish I could tell you I was dating, but I'm not, I am single and kinda looking but mostly not *shrug*. Well... enough with my life, lets go on to other stuff. I attend Calvary Apostolic Tabernacle in Paducah, KY. We believe that God is one and Jesus is God manifested in the flesh! We have had a whole lot of people washed from their sins by the blood of Jesus Christ. I myself have had the Holy Ghost(reference to the Holy Ghost just look in Acts, its all there!) for about 8 years years! I have been raised in this and believe strongly in it! You can learn much much more at the Website marked "The Doctrine of my Religion"! Well that's all I can think of right now! E-mail me and tell me what you think of it! Thanks for visiting I hope you like this. Hope you come back! BYEEEEEE!!!!!! !